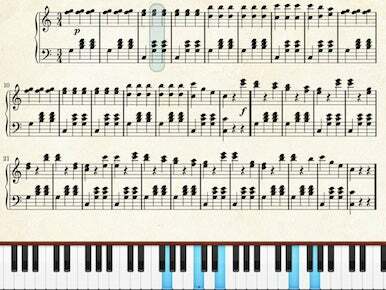 iPad owners looking to get in a little piano practice might want to check out Wonder Warp Software's Etude; the sheet music and piano-instruction iPhone app received an update on Wednesday, adding in iPad compatibility. While Etude's iPad version retains most of its iPhone features, the app's interface has been redesigned explicitly for the tablet. Sheet music, previously limited to a few measures at a time, is now displayed by the page (in portrait mode). Users can manually turn the page by flicking left or right when not in auto-play mode; otherwise, the app will automatically flow to the next measure. While in a piece, users can adjust its settings by changing the speed of Etude's auto-play (ranging from 1/4x to 2x), or by choosing to hide the on-screen keyboard or top navigational bar. Information about the piece, such as its composer, style, and length, can be displayed via popover; also included are links to Wikipedia and the iTunes Store. Etude comes with six pieces pre-installed, with others available via its own music store. As previously mentioned in our overview of the iPhone app, the app is currently only offering royalty-free classical pieces for download, but the developer hopes to offer a more modern selection as time goes on. Etude is priced at $5 in the App Store and is a universal app for any iPhone, iPod Touch, and iPad running iPhone OS 3.1 or later. Users who have previously purchased Etude for the iPhone should be able to download the iPad version for free.